It’s one thing to study about countries like India from a classroom thousands of kilometers away and it’s another thing entirely to experience their cultures firsthand. That’s why, every year, thousands of American students participate in hands-on study abroad programmes organised by the School for International Training (SIT). Established in 1964, the international organisation is located in Brattleboro, Vermont, and has a branch campus in Washington, D.C. It offers field-based academic study abroad programmes to undergraduates and accredited master’s degree and certificate programmes to graduates and professionals. SIT students come from across the globe, and include recent college graduates as well as experienced and mid-career professionals who want to sharpen their skills. The institute’s close to 80 study abroad initiatives for undergraduate students in more than 30 countries include specially-themed programmes focused on India. Each of these is crafted to provide students with unique perspectives on issues ranging from public health to sustainable development. The School for International Training describes its programmes as “experiential education,” wherein students spend considerable time interacting with local experts, leaders and institutions related to the themes of their programmes, like those on natural resources and refugee issues. Such personalised areas of focus are always related to the larger themes of each study abroad programme, but the specific topic of study is chosen by the students. They complete their semesters overseas by going deep into their chosen topics via a final, four-week Independent Study Project which, Hammer says, strengthens their connections with the people and places of their host countries. Denise DeFelice is a Philadelphia native in her third year at the University of Pennsylvania, where she is studying health and societies with a concentration in public health. 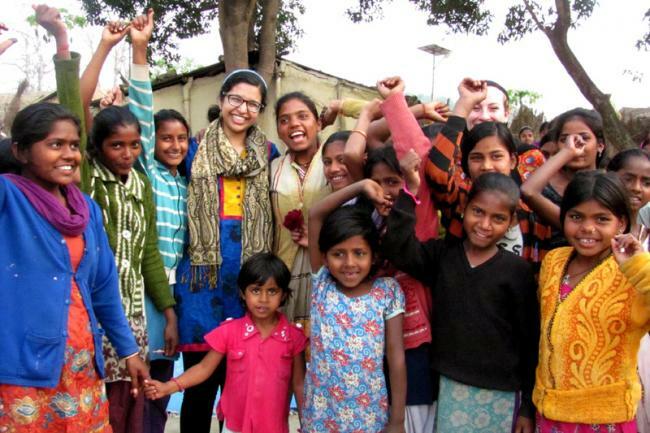 She learned about the School for International Training’s India programmes from her classmates in her major and decided to stay in New Delhi to study Public Health, Gender, and Community Action. “I was excited to learn about public health in a global context, instead of from my classroom in the United States,” she says. Elizabeth Curtis grew up in Boston, Massachusetts, and graduated from Williams College in 2017. She travelled to India in 2015 as part of a School for International Training programme in New Delhi, called Public Health, Policy Advocacy, and Community. She currently lives here as a recipient of the Fulbright-Nehru Student Research Fellowship. Before travelling to India, Curtis had long known that she wanted to study abroad. When it was time to choose a programme, she felt that the School for International Training was a perfect fit. “With an emphasis on excursions, workshops with NGOs, meetings with local experts and community members, and a final one-month Independent Study Project for students to do fieldwork on the subjects they’re most passionate about, SIT was the programme that got me excited,” she says. For her final Independent Study Project, Curtis researched community-based reproductive health programmes in rural Uttar Pradesh, focusing her efforts on government workers and institutions. She continues that work through her Fulbright fellowship. Like all SIT Study Abroad participants, Curtis lived with host families while abroad. It’s an experience, Hammer says, that can have positive and significant long-term impacts on all study abroad students. Curtis stayed with two families during her semester in India, and describes her experience in glowing terms, recalling how she used to stay up late at night with her host siblings, asking questions and telling stories. After completing her fellowship, Curtis aspires to attend a nursing school and work as a midwife, beginning a career to promote sexual and reproductive health. “Studying in India has greatly impacted my understanding of what government programmes and policies could look like for community and reproductive health, as well as challenges they can face,” she says.